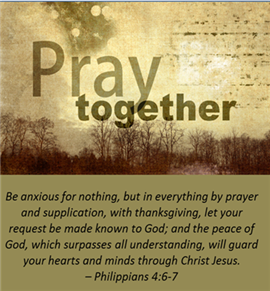 Prayer Gathering Wednesday evenings 6:15 – 7:30 p.m.
God invites us to enjoy Him and bring our needs to Him through prayer. This is available because of the relationship we have with Him through Jesus. He encourages us that we are His children, co-heirs and partners with Him in His work. God responds to His children's requests through the miracle working power of His Holy Spirit. We simply seek to pursue God and invite Him to have His way in us. As we do this, He causes His Kingdom to come and His will to be done in our midst. We pray for our families, church, community, country and world. We also pray for personal needs and other specific needs as requested or the Lord leads. If you have need of healing prayer, we would love to pray for you! Praising God that Ryan Blom’s cancer continues to retreat! Prayer for Pastor Carl and for complete healing over his kidneys. Continued prayer for Helen and for her complete healing from cancer. Continued prayers for Aleanor Kruisselbrink-Taylor as she continues to battle with cancer. The latest scan showed more activity. Praise for Stan’s great report concerning his cancer and continue to pray for his complete healing. Prayers for the Lind family. Continued prayers for Melanie as she is moved this week to a nursing facility to continue her therapy.